BOSTON, MA -- The holiday break is over, with all 13 teams returning to practice this week. As we get set for the final stretch of the regular season, we need to take a look back at the month of December. The final month of the 2017 calendar year included tons of great action across the Eastern Hockey League Premier (EHLP), and numerous candidates for the latest set of TSR Hockey Stars of the Month. 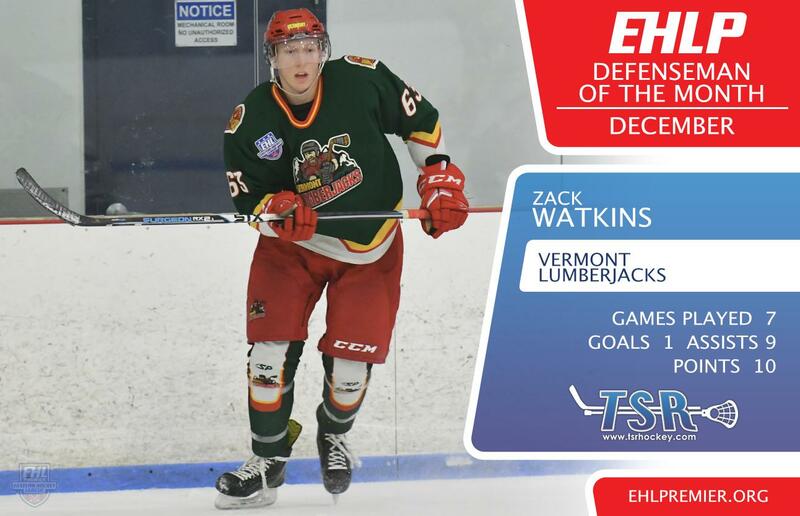 The EHLP is pleased to announce that Dave Tremblay (Central Penn Panthers), Zack Watkins (Vermont Lumberjacks), and Jon Szynalski (New Jersey 87s) have been named the TSR Hockey Stars of the Month for December. Tremblay took over the league-lead for scoring by putting together a month of December that included 21 points in 6 games. The 2000 born forward continues to turn heads, as he rides a 6-game point streak into the 2nd half. Dating back even further, Tremblay has at least a point in 13 of his last 14 games, and 18 of his last 21. The numbers that really jump out come when we break down the percentage of his team's goals that Tremblay has had a role in. To date, the Panthers have racked up 77 total goals this season, and Tremblay has either scored or assisted on 54 of those tallies, which adds up to over 77%. With 15 games remaining, the pressure is on Central Penn if they want to make a late-season playoff push in the South Conference. Tremblay and the Panthers will look to get things rolling this weekend when they host the Philadelphia Little Flyers on Saturday and the Philadelphia Revolution on Sunday. Watkins finished December with 10 points, which was tied for the league-lead in defensive scoring. The '97 now 24 points to his name, while having dressed in all but 1 of the Lumberjacks' games so far this season. After dropping their first 3 matchups of the month to the Boston Jr. Rangers, Watkins led the way on the blue line as Vermont put together back-to-back weekend sweeps of the Central Penn Panthers and Walpole Express to finish off the 2017 calendar year. Looking ahead, the Lumberjacks begin the 2nd half just 2 points back of the Rangers for the top spot in the North Conference. They will look to begin closing the deficit when they host the Express for 2 more games this weekend. Syznalski and the 87s went 4-1-1 in the month of December, and the '97 netminder was in net for all 4 victories. With the perfect month, Syznalski improves his record to 8-3-0 since joining the 87s in late October. Combined with his 5 starts for the New Jersey Renegades, Syznalski is 10-6-0 for the season to go along with a 2.77 GAA and 2 shutouts. Since joining the 87s however, Syznalski has helped New Jersey (2nd place) close to within 3 points of the Philadelphia Jr. Flyers for the top spot in the South Conference. They will look to to continue cutting into the deficit when they host the Jersey Wildcats on Saturday and the Philadelphia Little Flyers on Sunday.